Guitar strings change pitch as they tighten or loosen. Tighter strings produce a higher pitch, while looser stringers produce a lower pitch. This is how you tell if your strings are too tight. Strings that are too tight are unreasonably hard to hold down and produce an abnormally high-pitched sound. Guitars with tight strings tend to be painful to play on. Tight strings also tend to snap and break more often. Get out a guitar tuner and turn it on, or locate a piano. Play a note on your guitar. Play the same note on the piano if applicable. Compare the pitch of your guitar note with the piano note. If you are using a guitar tuner, look at what your tuner's display reads. Determine if the pitch is too high. Your guitar's pitch should be around the middle portion of the piano. 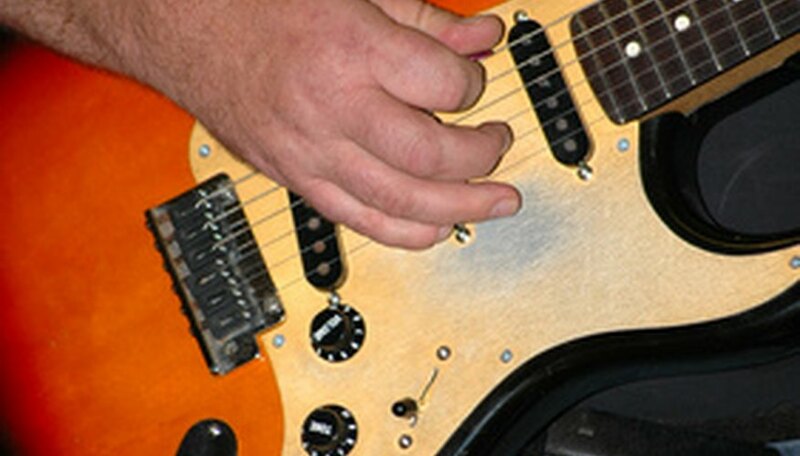 Set your tuner to "EADGBE" mode (the most common guitar tuning). If your tuner tells you to loosen your strings more than a few turns of your tuner knobs, your strings are too tight. Allan Hu has been writing since 2001 for several popular, self-owned websites like new-electronics.net and legitblogger.com. He is educated in clinical and psychoanalytic psychology, as well as marketing and advertising.